Located near the Sirohi District, Mount Abu is the only hill station in Rajasthan. It lies in the Aravalli mountain range at an approximate elevation of around 1,220 meters above sea level, with its highest point being 'Guru Shikhar' which is at a height of 1,722 meters above sea level. 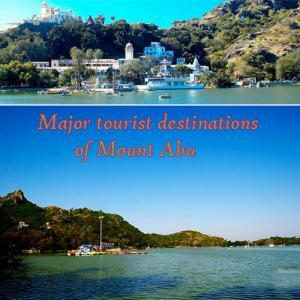 Here are the eight places to visit in Mount Abu. Known for their architectural splendour and exquisite stone carvings, the Dilwara temples in Rajasthan are dedicated to Jain Tirthankars. Located about 2.5 km from Mount Abu. The Forest located between the Aravalli mountain range was declared as a wildlife sanctuary in 1980 and covers an area of approximately 288 sq kilometers. It is a sub tropical forest which has an abundance of various species of flora and fauna. While there are traces of past dwellings of the lion and the tiger, but as of now the prime feline predator found here is the Leopard. Nakki Lake is famous for its cool and calm atmosphere due to its ideal location in the backdrop of the Aravalli Mountains. It is the sole artificial lake in India, which is situated at a height of more than 1,200 m. Legend states that it has been carved out of rocks by Gods. Peace Park in Mount Abu is a part of the Brahma Kumaris spiritual establishment. The park is a perfect escapade from a hectic city life to find serenity.